Active and retired clergy of the Baltimore-Washington Conference are invited to join Bishop LaTrelle Easterling for a special Lenten Day Apart. This event will focus on contemplative practices and will be held from 9 AM to 3 PM at Glen Mar UMC (4701 New Cut Road in Ellicott City). The cost is $35 for active clergy and $25 for retired clergy; the fee includes a catered lunch. Retired clergy must enter a special code to receive the discounted rate. Enter "RETIRED" (all caps) when you register. SIGN-UP today and reserve your seat. DS JW Park is inviting clergy and their spouse or friend to be his guest at a festive Clergy Appreciation Dinner on February 28, 2019 from 6-9 p.m. at Saint John United Church, 10431 Twin Rivers Rd, Columbia, MD 21044. There will be music and live entertainment. RSVP required, click HERE to register. Registration deadline is February 12. From 9 AM to noon, Bishop Easterling is calling the people of the BWC together at the Mission Center and via live streaming to pray and share information following the Special Session. Join us at the Mission Center or via live streaming at Bethany UMC (2875 Bethany Ln. Ellicott City, MD 21042-2213) or Grace UMC (119 N Frederick Ave, Gaithersburg, MD 20877-2441). There’s something for everyone at Leadership Day! Bring your team for a time of inspiration and equipping so that you and your congregation are better able to move forward together and joyfully. Download the EVENT GUIDE for full details and REGISTER. If you were unable to attend one of the Sexual Ethics and Boundary Trainings in January, please register to attend a make-up session. If you registered but did not attend, arrived late or left early, please contact me so I can make the change on my end. Central Maryland District’s make-up session will be held at the Mission Center in Fulton, MD from 10 AM - 4 PM. The fee is $35 and lunch is included. It is important that every pastor attend a Sexual Ethics and Boundary training. Please feel free to contact me with any questions. REGISTER today. 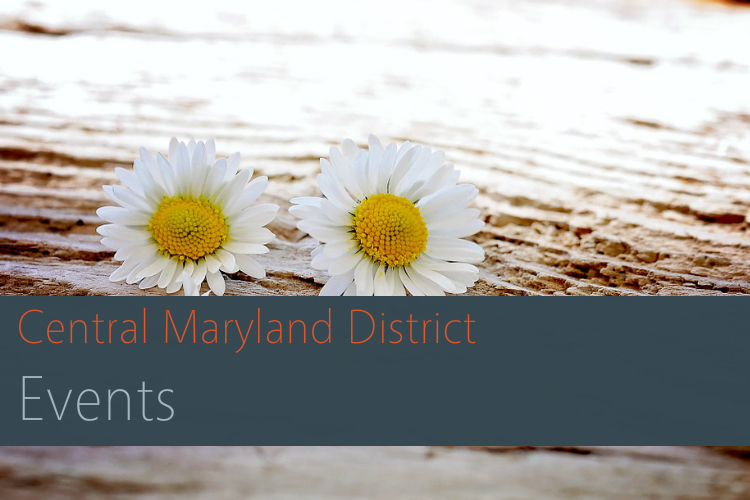 DOWNLOAD the Central Maryland District calendar to learn about other educational and networking opportunities coming up. Do you have an event going on at your church? Let us know!